"Being a brief on men who suffer." Part 1: Common causes of clown deaths / Part 2: Typical serious symptoms for average males. PRINT RUN IS LIMITED TO ONLY 200 COPIES. The ROTLAND DREADFULS series is an homage to the cheaply-produced 19th century English pamphlets known as "Penny Dreadfuls"— so named because the original cost was one penny and they contained stories considered shocking and sensational. The ninth issue in this series concerns the "birth of horror." The ROTLAND DREADFULS series is an homage to the cheaply-produced 19th century English pamphlets known as "Penny Dreadfuls"— so named because the original cost was one penny and they contained stories considered shocking and sensational. The eighth issue in this series concerns "the debt and the damages." The ROTLAND DREADFULS series is an homage to the cheaply-produced 19th century English pamphlets known as "Penny Dreadfuls"— so named because the original cost was one penny and they contained stories considered shocking and sensational. The seventh issue in this series is an adaptation of headlines found in the late 19th/early 20th century English tabloid "The Illustrated Police News." The ROTLAND DREADFULS series is an homage to the cheaply-produced 19th century English pamphlets known as "Penny Dreadfuls"— so named because the original cost was one penny and they contained stories considered shocking and sensational. The sixth issue in this series is an adaptation of a fairy tale by the Brothers Grimm. The ROTLAND DREADFULS series is an homage to the cheaply-produced 19th century English pamphlets known as "Penny Dreadfuls"— so named because the original cost was one penny and they contained stories considered shocking and sensational. 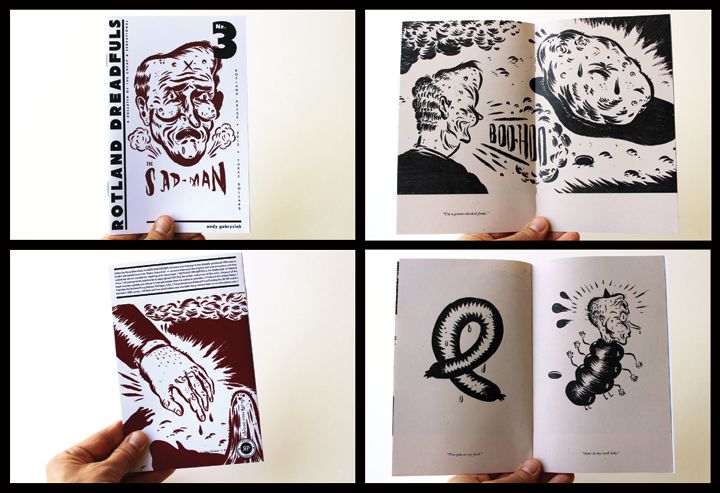 The fifth issue in this series is an adaptation of the Appalachian murder ballad "Knoxville Girl," created entirely from woodcuts in the tradition of the wordless woodcut novel. The ROTLAND DREADFULS series is an homage to the cheaply-produced 19th century English pamphlets known as "Penny Dreadfuls"— so named because the original cost was one penny and they contained stories considered shocking and sensational. The fourth issue in this series concerns "making it look fancy." The ROTLAND DREADFULS series is an homage to the cheaply-produced 19th century English pamphlets known as "Penny Dreadfuls"— so named because the original cost was one penny and they contained stories considered shocking and sensational. The third issue in this series concerns "a man and his acne." The ROTLAND DREADFULS series is an homage to the cheaply-produced 19th century English pamphlets known as "Penny Dreadfuls"— so named because the original cost was one penny and they contained stories considered shocking and sensational. The second issue in this series concerns "a small illustrated rogues gallery depicting some of the people populating the community known as The Pointes, whose residents include trust fund leeches, estranged, substance addicted offspring, and lecherous 'sailors.'" 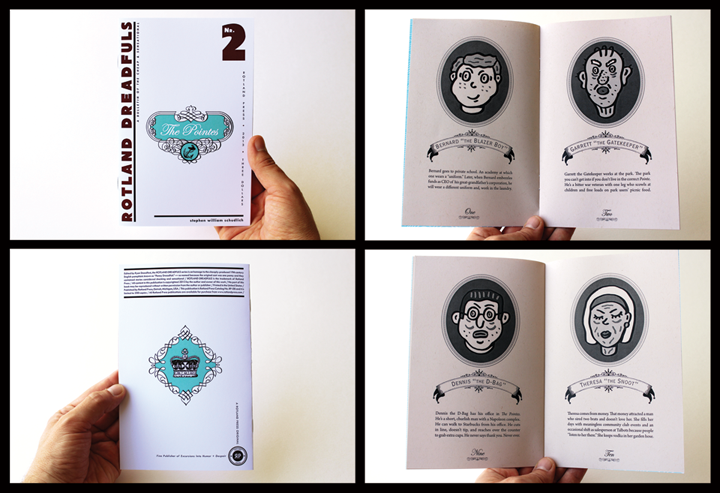 The ROTLAND DREADFULS series is an homage to the cheaply-produced 19th century English pamphlets known as "Penny Dreadfuls"— so named because the original cost was one penny and they contained stories considered shocking and sensational. The first issue in this series concerns "a tale of convenience and survival, amongst mean and cheap merchandise." BLACK EYE 2 : the anthology of humor and despair. With texts by: Paul Krassner, groundbreaking editor and founder of The Realist (1958-2001), who provides a previously unpublished essay / Bob Levin offers up an excerpt from his unpublished satirical novel The Schiz / Jesse Nathan, poetry editor of the McSweeney’s Poetry Series, contributes new poetry and prose pieces / the late Michael O'Donoghue, a major creative force behind the early years of The National Lampoon and the first head-writer for Saturday Night Live (on which he appeared as "Mr. Mike") is present with a long out-of-print essay that once appeared in Spin magazine. Print run is limited to 1000 copies. 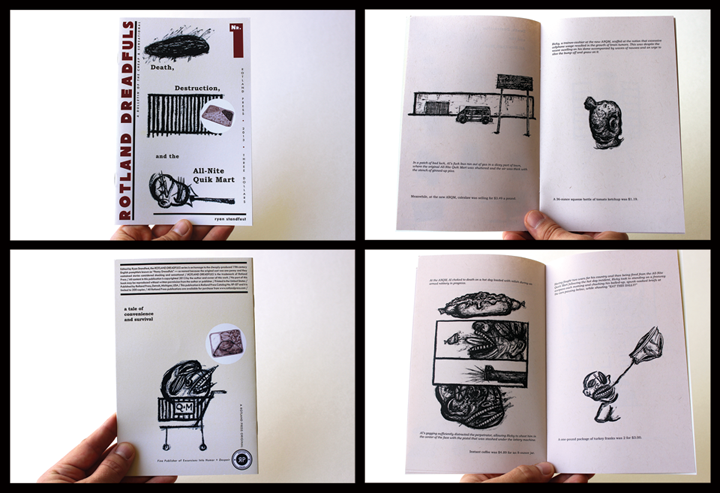 A limited edition Rotland Press Original. 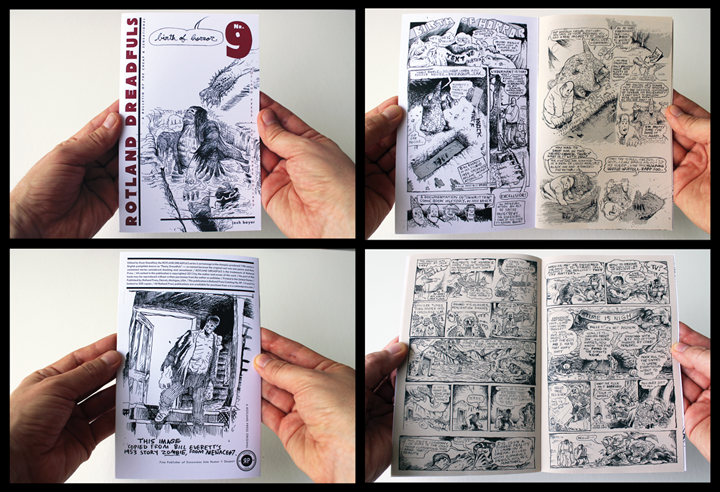 Texts and images, narratives and fragments, comics and gags by Ryan Standfest. Includes such pieces as The Slackpatch Radius, Two Chumps, The Festerbob Split, Factory Head, The Tub of Sap, Mister Jim's Nine Troubles and more! PRINT RUN IS LIMITED TO ONLY 150 COPIES, signed, numbered and dated by the author. "Organic creations of grotesque visual disturbery are interspersed with written narrative and character spewed dialogue, the kind of which one might overhear while seated silently, undetected in a bus station bathroom stall. Like a fantastic afternoon car wreck where strangers’ lives hang in the balance, Standfest stages a marvelous collision of image and word that one can’t look away from." An ultra-limited edition catalog to the exhibition MOROSE DELECTATION, held at The Book Beat Bookstore + Gallery, from June 5 - August 5, 2011. 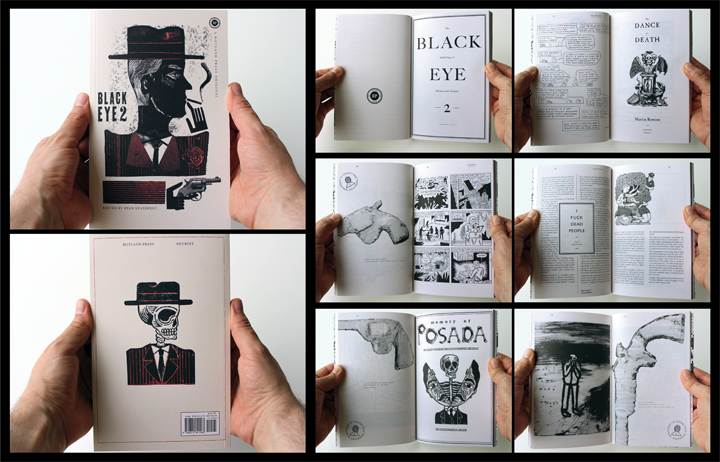 This is a companion to the anthology BLACK EYE 1, presenting works on paper by ten of the contributors to that book: Max Clotfelter, Andy Gabrysiak, Ian Huebert, Kaz, James Moore, Tom Neely, Paul Nudd, Onsmith, David Paleo and Stephen William Schudlich. 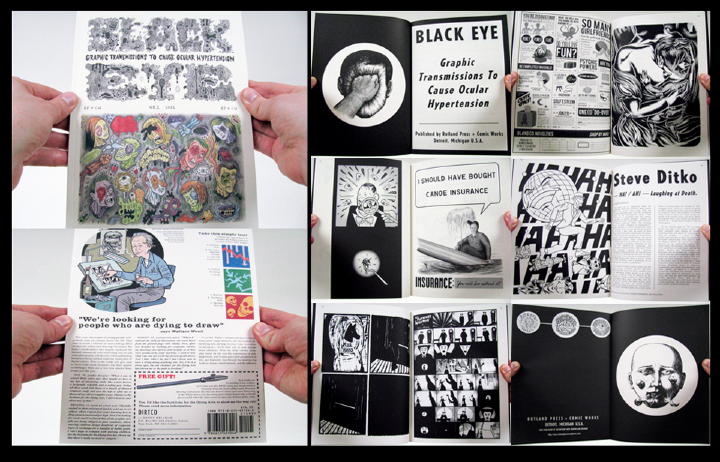 In the same vein as BLACK EYE 1, this publication collects comix and art from the MOROSE DELECTATION exhibition along with additional images that express Black Humor. Generously illustrated with previously unpublished images NOT found in BLACK EYE 1, this book contains an introduction and new texts written by all of the participating artists— addressing the relationship of their work to Black Humor. 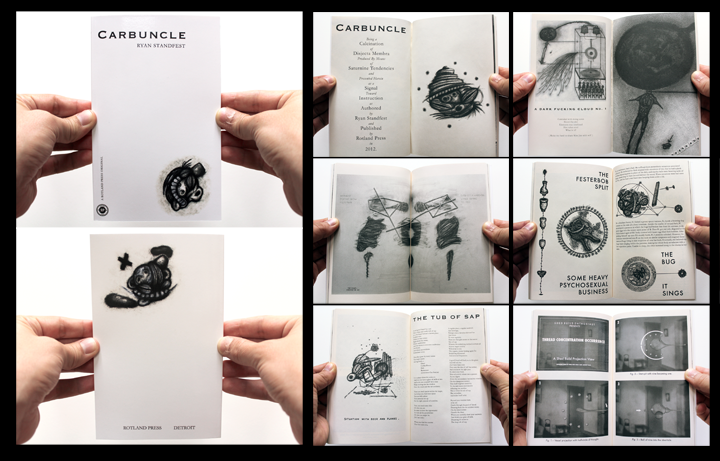 PRINT RUN IS LIMITED TO ONLY 100 COPIES, signed and numbered by the editor in silver ink and hand-stamped with a special "Rotland Press Limited Edition" logo. An anthology focused on the expression of black, dark or absurdist humor. 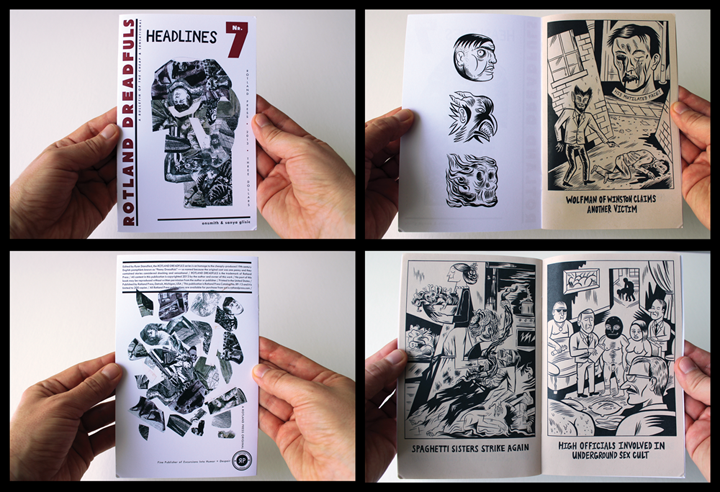 With comics and art by Stéphane Blanquet, Ivan Brunetti, Lilli Carré, Max Clotfelter, Al Columbia, Ludovic Debeurme, Olivier Deprez, Nikki DeSautelle, Brecht Evens, Andy Gabrysiak, Robert Goodin, Dav Guedin, Gnot Guedin, Glenn Head, Danny Hellman, Paul Hornschemeier, Ian Huebert, Kaz, Michael Kupperman, Mats! ?, Fanny Michaëlis, James Moore, Tom Neely, Mark Newgarden, Paul Nudd, Onsmith, Emelie Östergren, Paul Paetzel, David Paleo, Martin Rowson, Olivier Schrauwen, Stephen Schudlich, Robert Sikoryak, Ryan Standfest, Brecht Vandenbroucke, Wouter Vanhaelemeesch and Jon Vermilyea. Original essays by Jeet Heer (on S. Clay Wilson), Bob Levin (on The Adventures of Phoebe Zeit-Geist), Ken Parille (on Steve Ditko) and Ryan Standfest (on Al Feldstein and EC). Also includes the text 100 Good Reasons to Kill Myself Right Now by Roland Topor, translated into English for the first time by Edward Gauvin. Print run is limited to 1000 copies. "It has a good feel." —David Lynch, filmmaker and artist. Nominated for the 2011 Ignatz Award in the "Outstanding Anthology or Collection" category. Catalog to the exhibition FUNNY (not funny), held at the University of Michigan School of Art + Design WORK·DETROIT gallery, from January 22 - February 26, 2010. An overview of Black Humor as manifest in contemporary American alternative comics, it included the work of Ivan Brunetti, Chris Cilla, Sue Coe, Lisa Hanawalt, Glenn Head, Tim Hensley, Ian Huebert, Ben Katchor, Michael Kupperman, Mats! ?, Daniel Maw, Taylor McKimens, Travis Millard, Tom Neely, Mark Newgarden, David Paleo, Jonathon Rosen, David Sandlin, Rob Sato and Jon Vermilyea. This publication is fully illustrated with images both new and old (many of which previously unpublished), and contains a comprehensive essay on the history of Black Humor in American comics. and new statements written by all of the participating twenty artists, addressing the relationship of their work to Black Humor. Print run is limited to 1000 copies.